Hidden behind green trees, this restaurant is an exquisite spot to taste the most authentic Italian recipes, meticulously prepared by the skilled hands of Chef Romano. Indulge in the pleasure of their pesto pasta or their creamy tiramisù. 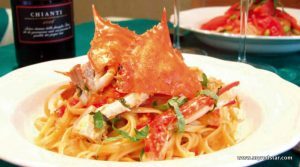 Trattoria Verde produces what is arguably the best authentic Italian food in town. Although a little pricier than other restaurants, the food quality is second to none. They also have an impressive selection of imported wines to choose from.